Torres del Paine National Park is located in the province of Ultima Esperanza, northern part of the Region de Magallanes y Antartica Chilena, also known as the XIIth. region of Chile. Created in 1959, today its area is 227,298 hectares, the distance from Puerto Natales, the nearest city is 112 km and from Punta Arenas, the regional capital is 312 km. 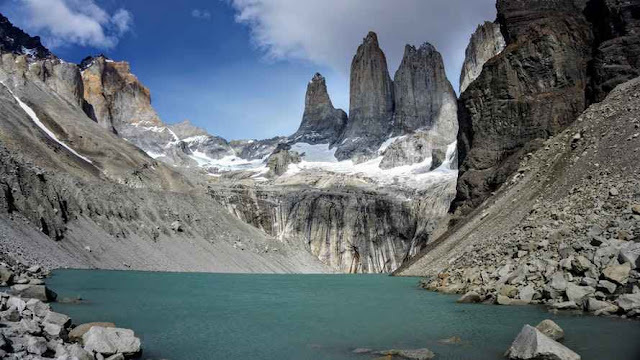 The park, managed by CONAF (National Forest Corporation) presents a wide variety of natural environments, such as the world famous Torres and Cuernos del Paine, valleys, lakes, waterfalls and rivers from glaciers of the neighboring Campo de Hielo Sur (Southern Ice Fields), one of the largest freshwater reserves on Earth. In 1978 the Sanctuary was declared Biosphere World Reserve by the UNESCO and in 2013, it was chosen The Eighth Wonder of the World by Virtual Tourist, among 300 tourist destinations of 50 countries. Year after year, the number of visitors, especially foreigners from all over the world has been increasing, a condition that has forced to apply certain restrictions that in the past did not exist. Parque Nacional Torres del Paine borders with Los Glaciares National Park, in Argentina. Rio Don Guillermo Border Crossing unites these two great tourist attractions. By Air: It is the most usual way used by travelers. From Santiago, the Chilean capital to Carlos Ibañez del Campo Airport in Punta Arenas, the flight lasts approximately 3 1/2 hours without considering any stopover. You can spend the night in Punta Arenas, 22 km South of the airport and 312 km from the park or go directly to the city of Puerto Natales, 112 km from the entrance of the protected area. By Sea: This is the most scenic means to reach the National Park. From the city of Puerto Montt to Puerto Natales there are 4 days of unforgettable sailing through the Southern Channels, Glaciers and forests that reach the shore of narrow fjords. Ferry Routes Here. By Land: The shortest way between Santiago and the city of Punta Arenas is of approximately 3100 km. The route is through Chilean territory to the cities of Osorno or Puerto Montt, from there you cross to Argentina until reaching Integracion Austral Border Crossing, also known as Monte Aymond, the most important of the Magallanes Region. Paso Internacional Integracion Austral is located 196 km NE of Punta Arenas by paved route and 336 km from Puerto Natales. Torres del Paine can be visited at any time of the year, although undoubtedly the Summer season, between December and March is when the largest number of tourists arrive at the place. Just like throughout the Patagonian region, the weather in Torres del Paine is unpredictable, the temperature can occasionally reach up to 20-22 degrees C., but the average ranges between 10-12 degrees C., the winds are sometimes very strong and can easily reach 120 km / hour or more. However, in Winter the Natural Sanctuary acquires a different majesty when it is covered with a white mantle of snow, generally between June and August. At this time the average temperature is 0 degrees C. and the winds are very moderate. The low season runs from May 1 to September 30 of each year. The Sede Administrativa (CONAF Administrative Headquarter) is located on the north bank of Lago Toro, where there is also a Visitor Center and a Lookout. In the offices are processed the permissions to climb the summits of the area and the Fishing Licenses. There are 4 Porterias (Entrances) to register, pay the ticket and receive information: Rio Serrano, Laguna Amarga (the 2 main access points), Laguna Azul and Lago Sarmiento. There are also the "Guarderias" (Ranger Stations): Lago Grey, Laguna Verde, Lago Pehoe, Pudeto, which remain open all year round and there are also Guarderias in faraway places enabled only in the high season, in all of them the rangers provide the necessary information to the visitors that require it. Torres del Paine is one of the most famous tourist destinations in Patagonia, the infrastructure to serve tourists goes from Free Campsites, which have basic services and you must take your camping equipment and food; Paid Campsites, with many more amenities than the free ones; Refugios (Shelters), the most comfortable option but with the highest cost. For those who do not like physical effort there are cozy Hosterias (Inns) and Hotels, including Five-Star. There are also navigation services, food sale, horseback riding and crafts. The main camping sites are: Rio Serrano, Pehoe, Lago Grey, Laguna Azul, Paine Grande, Lago Dickson, Los Perros, Seron, Los Cuernos. Some of the most outstanding Hotels and Inns in Torres del Paine are Explora Patagonia Hotel Salto Chico, Rio Serrano Hotel & Spa, Hotel Las Torres Patagonia, Hosteria Lago Grey, Hosteria Pehoe, Patagonia Camp, Ecocamp Patagonia, Hotel Del Paine, Cabanas Lago Tyndall. To spend the night in Mountain Campsites is mandatory to have Bookings (here). In short, access, infrastructure and services are of unbeatable quality, the only thing that is left to chance is the climatic factor. Undoubtedly, the center of attention and main reason to visit the place is to enjoy the Geological Wonder represented by the Granite Towers and Horns, and immortalize them in a few photographs or videos. But it is not only that, you will also appreciate the environment constituted by a variety of Lakes of iridescent waters, highlighting the Grey, Pehoe, Nordenskjold, Sarmiento, Toro, Paine, thousand-year-old Glaciers such as the Grey, Tyndall, Geyke, Pingo, etc. Vehicle Tours, a comfortable and frequent way to get to know the Biosphere Reserve, is through its 100 km of roads. In the nearby city of Puerto Natales and the regional capital Punta Arenas there is a good number of Rent a Cars and Tourism Agencies for this purpose. From Puerto Natales can be accessed through 2 different roads, the route through Cerro Castillo of more than 150 km, which leads to Laguna Amarga and Sarmiento Entrances. The other route is the most recent 80 Km. road passing through La Cueva del Milodon Natural Monument (Mylodon's Cave), in this case the Entrance is Porteria Serrano. Serrano River Navigation, the stunning voyage is divided into two stretches, the first begins in Puerto Natales, sailing through the Ultima Esperanza Fjord to Bernardo O'Higgins National Park, visiting the Balmaceda and Serrano Glaciers, then boarding semi-rigid boats and navigating upstream to the Park. The "W" Trekking Circuit, one of the most famous trekking routes in the World, through the main attractions of the National Park. Called "W" because of the shape it takes when joining the points where it passes: Valle Ascencio, Valle del Frances and Glaciar Grey. The walk has a length of 71 km, it can be done between 4 to 5 days. The "O" Trekking Circuit, a route of just over 110 Km., very demanding physically and mentally, the approximate duration is 7 to 8 days, the "O" includes the "W" circuit. 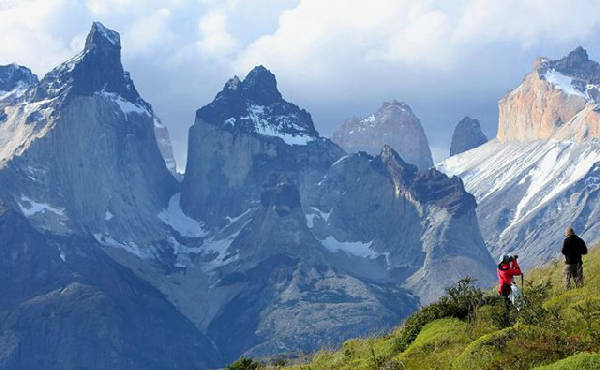 Its name refers to the circular shape of the route which also shows the hidden side of the Park as it goes around the entire Torres del Paine Massif. You get impressive views, including the Campo de Hielo Sur (Southern Ice Field) from the height. Wildlife Watching that inhabits the Reserve, of varied type including the typical Guanacos everywhere, other mammals such as the Puma, Ñandues, different species of Foxes, the Huemul and the Condor, animals represented in the National Coat of Arms. Excursion and Navigation of Grey Glacier, located in the Western part of the Park, also forming part of the Southern Ice Field, one of the main attractions and one of the must-see excursions when visiting Torres del Paine National Park.